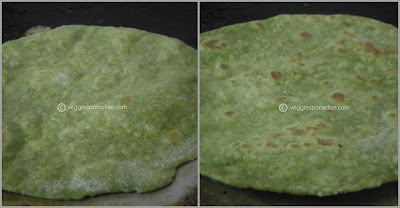 PALAK CHAPATHI - Chapathi , an everday bread is made in different ways in all our houses. 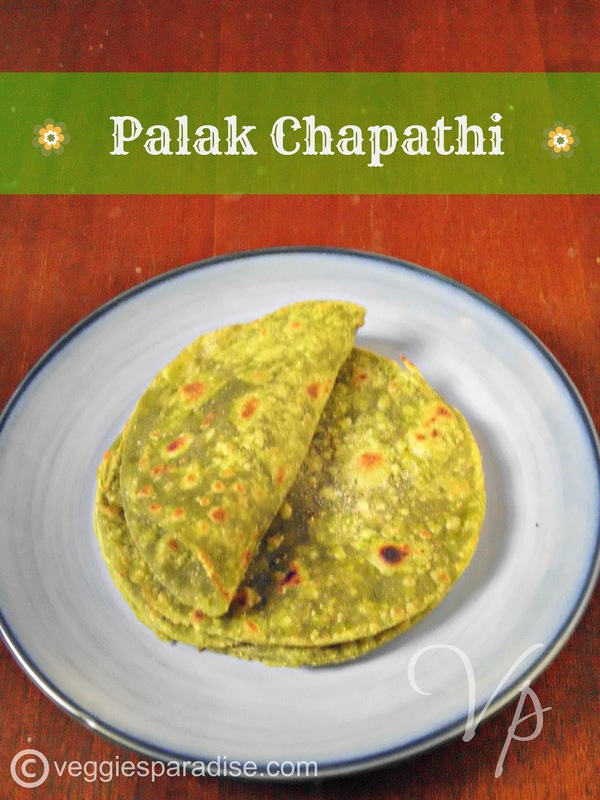 Everyone has a unique method in preparing the dough.Here I come with an healthy and delicious version of chapathi with Palak. A soft dough is made with flour, spinach puree, salt and water. It is divided into equal sized balls, rolled into flat disc and cooked in a frying pan,under medium heat. This chapathi goes well with a mild curry. In a pan, put the spinach leaves and green chillies along with some water, cook it uncovered on high heat until done, for about 5- 8 mins. Allow it to cool and grind to a thick puree in a blender. 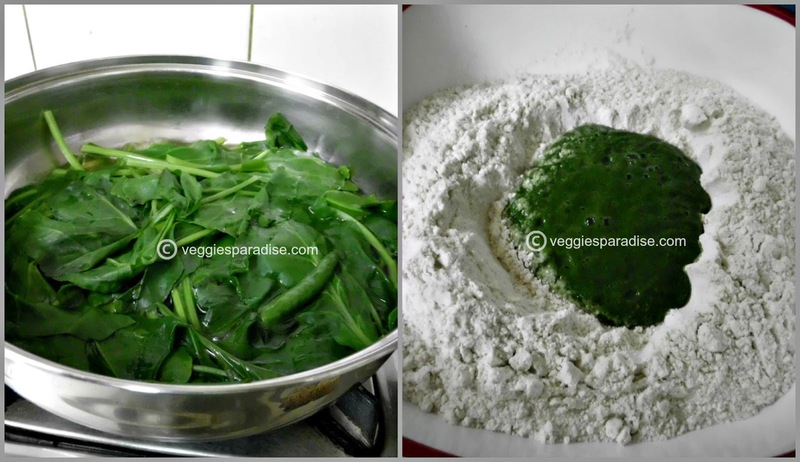 In a large mixing bowl,combine the flour ,spinach puree and salt . Add enough water and knead to a form a firm dough and let it rest for 10 mins. Divide the dough into lemon sized balls. Flour the board and roll out each ball. Heat a flat saucepan and place the roti's in it. Brush the top with oil, when the underside begins to brown , turn over to the other side and cook in a medium flame. 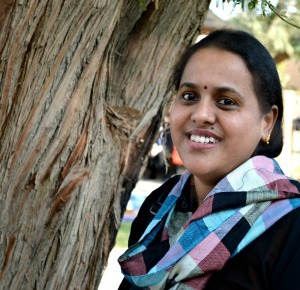 Make the rest of the chapathi's similarly. 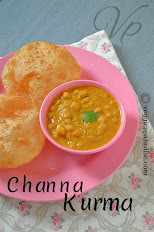 Very healthy chapathi and good for lunch box. Wat a fabulous way to sneak the healthy palak, prefectly rolled chapathis. 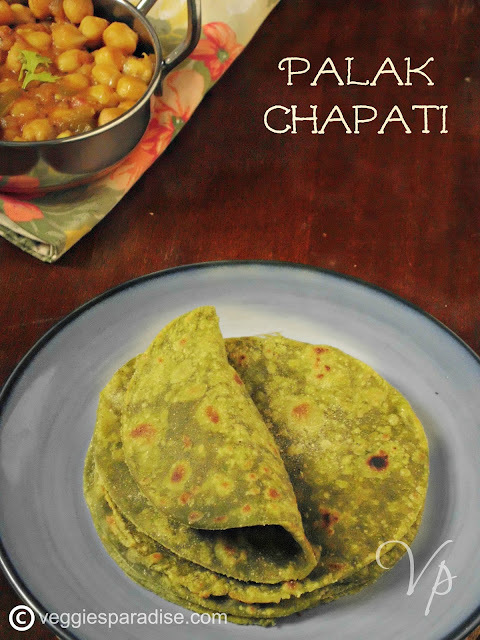 Love the healthy chapati and this is also a favorite of my family! a healthy and delicious chappathi.. This is one of our favourites at home. Perfect and very healthy chapati...loving it..
Palak chapathi looks really yumm. Chappathi looks so healthy n yumm..
wow very nice n haelthy chappathi,luks gr8!